Chennai: The Thursday evening at Lady Andal School situated at the heart of city was spotted with more emblazonments and embellishments with glitz, glamorous and more grandeur. Bringing the best acclamations and jubilations with top-notch stage adornments, colossal dance performance and Emcees sending heavy rush of humour and fun with crème de la crème presentations. The 2nd Edition of TEA awards brought forth an immense celebration among the spectators bestowed with unlimited entertainment with heavy rush of amusements. 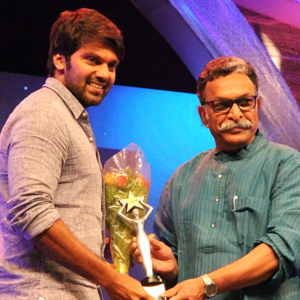 The handsome choco-chap Arya stepped on with irresistible applause across the crowds to bag the ‘Festive Celebrators Award’ for the Best Cool Drinks Ad (Mountain Dew) and GV Prakash gained the same accolades for composing music for this advertisement. Speaking on the occasion, Arya cited that TEA AWARDS is a great attempt to redefining the essence of hard work and creative abilities of talents and brain heads. GV Prakash for his part expressed his heartfelt thanks for TEA AWARDS committee members. Adding more topping to the delicious celebration was the young music director turned actor performing few lines of ‘Bittu Padam’ from his recent successful film ‘Trisha illana Nayantara’. Mr. Nasser relishing the great success at Nadigar Sangam elections as he embarks on his journey into the accomplishments of many developments won ‘Best Construction Ad’ for his manly roaring voice and performance in AGNI TMT commercial advertisement. The beautiful angelic actress Janani Iyer splashed up beauteous moments with her appearance to collect ‘The Exquisite Pic’ Award for her stunning looks in Print AD of OKJ Jewelers. The Best Jewellery Ad – The Glittering Dazzler Award – Mr. Keasavan bagged the awards for this category on the behalf of Joy Alukkas. Mr. Rajamani, the most celebrated personality from Astro Vanavil came up winning special recognition for his contribution towards promos and creative programming in Malaysian Tamil Channel. He also revealed some of his future plans about promoting Tamilians’ talents and potentials. Mr. Selvakumar, CEO of My Tamil Movie.com, Edison Awards, TEA Awards and WTCC rendered a wonderful speech at the ceremony of the great dreams and accomplishments. He also revealed his next plans through WTCC to connect and promote Tamil, Tamil Culture and Tamilians all over the world with a prominent brand ambassador, who has won the Nadigar Sangam elections. The Dwarions Dance Group offered the best enchantments with their spellbinding dance performance including the mix of Baahubali and many more latest releases.